friday friday friday! why has this week been soooo long and yucky? i know. it's the middle slump of december when it's not quite close enough to christmas for me to be in the super holiday spirit, but be annoyed by the influx of shoppers in the stores and on the roads. it's way colder than last week which is siiiiiick. it's the week before finals so no more assignments are due but it's not the right second to start cramming for the tests. the heater is still broken in my office so i'm in a sweatshirt, snuggie, and blanket and slippers. blah. lame. 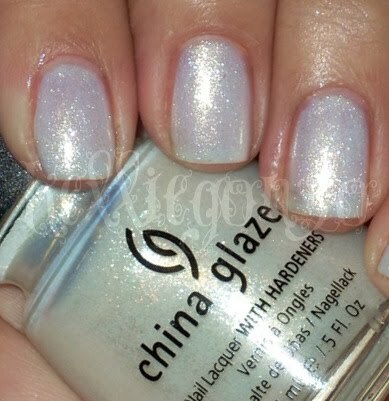 so what better to perk me up than a manicure of this fantastic varnish from china glaze! white-kwik-silvr it is totally my favorite white polish ever. it is one of the "glass flecked" polishes ala grape juice and watermelon rind etc. it looks amazing on anyone and it's perfect for winter :) this is three coats.